When you’re considering a move, would you prefer a professional moving service that is federally licensed, or would you prefer a service that is not covered? Moving Connections is not only federally licensed, it is also bonded and insured in accordance with federal standards. When you want someone to move your goods safely and efficiently, would you prefer someone who hires only workers with experience in the moving industry, or would you prefer someone who hires workers with no experience out of temp agencies or even loitering in home improvement store parking lots? Moving Connections hires only workers with experience in the moving industry for its moving teams. When you ask for a price quote, do you want someone to give you a quote and then at the end of your move, add 50% to the price with spurious fees, rentals, surcharges and non-existent taxes? Or would you prefer someone who has a straightforward and simple pricing formula, i.e., you pay an hourly rate for driving time and labor time, plus a very reasonable price for boxes and tape, with no extra fees, surcharges, or taxes of any kind added on? Moving Connections gives you an honest, fair quote and adds no junk fees or phony taxes or anything of any kind to your bill. You pay for driving time and labor time, plus boxes and tape. That’s it. People want and deserve a fair deal and that’s what you’ll get from Moving Connections. Please click on a tab below for the type of move that interests you. The Labor Only Move is a cost saving move where customers provide much of the labor and driving themselves. The Residential Move tab describes our full service residential move, and the Corporate Move tab describes our business move services, from micro office moves to large corporate relocations. If Moving Connections is moving you to Taylorsville it's a perfect time to begin to utilize the many resources and bounties of Taylorsville. For example click on the picture to the left to go the Moving Connections 'Support - Advice - Assistance' page and discover Taylorsville for the first time. Once you are on the 'Support - Advice - Assistance' page go ahead and open the .pdf link found there and tape the list of emergency and useful phone numbers on your refrigerator. 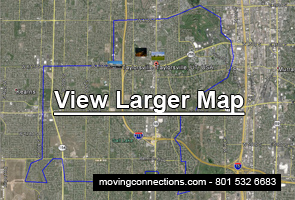 Moving Connections has gone to great pains to find those links and connections to integrate you quickly into Taylorsville life. Although Moving Connections’ “Labor Only” option can save a substantial amount of money, our complete service Residential Move remains our most popular option. Maybe it’s because customers find that the peace of mind they enjoy when a professional handles the move is well worth a few extra dollars. After all, tending to the details of a move, plus all the intense physical labor that’s involved, can tie your insides in knots and give you back pains for years to come. And those are things that Moving Connections would like to see their customers avoid. And they are able to avoid those things because Moving Connections’ professional moving teams are the best in Utah and they will make your move a smooth transition to your new home. The Moving Connections “Labor Only Move” can cut moving costs significantly by allowing you to a) do much of the packing, b) having you rent the truck that will transport your goods, and c) having you do the driving of the truck to your new home, where you will do the unloading and unpacking. Since Moving Connections only charges for time plus boxes and tape, you stand to save a lot with this arrangement. If you don’t mind driving a rental truck and unloading it, this can be a great cost saving option for you. And don’t worry, Moving Connections will have two or more iron men wrap and professionally load the heavy and large items onto your truck. So you’ll have their loading expertise as well as their muscle power to help you with the more difficult items. If you provide professional, top quality service as a business principal officer or manager, then you expect and deserve top quality, professional service from your mover. And that’s just what you get when you move your business with Moving Connections. As a top tier professional moving service, Moving Connections fields the best moving crews in Utah. This is because we hire only experienced professionals for our moving teams. Moving Connections is federally licensed, bonded, and insured for your protection. So you know you’re dealing with someone who’s in business for real. And the pricing at Moving Connections is the simplest you’ll find in the moving industry: you pay for driving time and labor time, plus tape and boxes (actually, you get ½ hour driving time on the return trip free, but that works to your advantage). In addition, we have a full range of ancillary services, such as conventional and climate controlled storage, as well as professional crating and shipping services.